A ranking system will benefit your business by driving retention and loyalty. 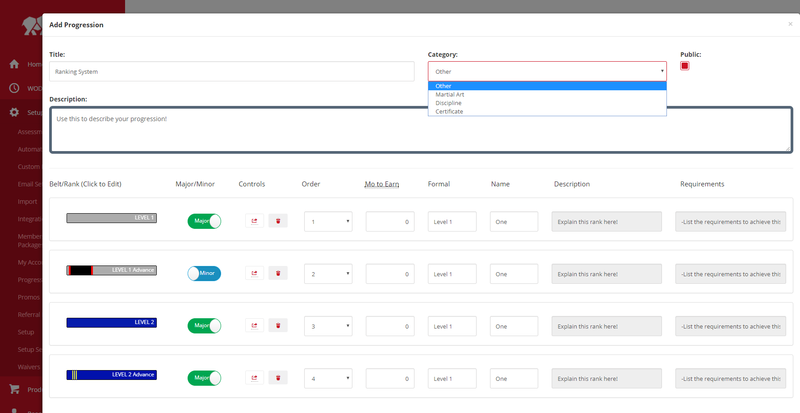 The RhinoRank feature is customizable, allowing you to create and manage ranks, certifications, or martial arts belts. RhinoRank accommodates the most complex of ranking systems, allowing subcategories in each rank such as belt stripes. Furthermore, you can distinguish time and requirements needed for progression. RhinoFit offers reports that view upcoming testing, ranks earned, as well as the top-ranking individuals in your gym or dojo. Your progression system can be easily displayed for public view, allowing both members and prospects the opportunity to view your ranking system. Once you are signed into your RhinoFit account, please click on “Setup” then Progression and Rank. From this page, you are able to set up a public background image used in your display of ranks, are provided with a link to publicly display your progressions or belt system, select a customizable template based on your martial arts style, as well as create a new system from scratch. Click on + Add Progression to customize a new ranking system. You have full customization options when adding a new progression, martial arts belt, or certificate. After you add the system’s title, description, and category, move onto your ranks/belt, sub category (major/minor), and details on how to advance onto the next level. Hello, thank you for your comment on our blog. My suggestion for being added to the Yahoo News list is to implement press releases about your business to the numerous news outlets via distribution channel services such as EIN Presswire, or PR Web. Thank you again.